Build a distraction device to hold the zombies’ attention while you make your escape. Take the L.E.D. so it straddles the battery with the short leg on the (-) side and the long leg is on the (+) side. The L.E.D. will only work if the legs are connected this way around. Connect one wire of the vibration motor to one side of the battery and the other wire to the other side. It should start vibrating. Now let’s combine the motor and the L.E.D. Peel the insulation tape from the side of the bag and use it to stick one of the vibration motor wires & the long leg of the L.E.D. to the (+) side of the battery (Fig.1). 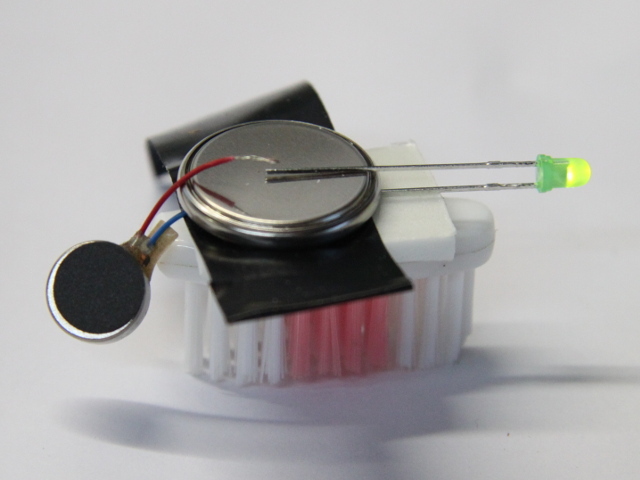 Get an adult (preferably not a Zombie) to snip the head off the toothbrush (Fig.2) and stick your battery/motor mechanism to the toothbrush head (Fig.3). Use the insulation tape to stick the short L.E.D. leg and the second motor wire to the other side of the battery (Fig.4). Building more and more complex circuits, including some using motors, sensors and switches.